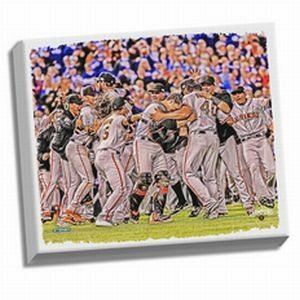 This Breathtaking Stretched Canvas of the 2014 San Francisco Giants World Series Champions Celebration is the perfect way to take your man cave to the next level. This piece is hand-created exclusively at Steiner Sports' Headquarters in New Rochelle, NY, and is professionally printed on an extremely high quality 20-mil thick mid-gloss canvas. The canvas will arrive pre-stretched and ready to hang on your wall. This is a must have for any true sports collector who is looking for a classier alternative for their home.